Audio Ease have announced via their Facebook page that Altiverb v7 is now available in AAX 64 bit for use with Pro Tools 11. If you are an Altiverb 7 user your free update to Altiverb 7.1 is released today. This update features the all new AAX 64 bit plug-in for Pro Tools 11 and upgraded graphics for retina displays. Altiverb 7.1 smoothly replaces all Altiverb instances in your existing sessions. You can download your Altiverb 7.1 today from the Audio Ease site. Altiverb 7.1 is a Mac only plug-in, available in 64 bit and 32 bit as AAX Native, VST, MAS and Audio Unit. Like Pro Tools 11, Altiverb 7.1 now requires an iLok 2 USB key. An Altiverb 7.1 license cannot be stored on an iLok 1 USB key. In case you do not have an iLok 2 USB key we offer it to registered Altiverb customers at the greatly reduced price of: $35 USD including world wide shipping (normal price is $49 USD excluding shipping). You can use the iLok License Manager app to transfer the license from your iLok 1 to your new iLok 2 key. 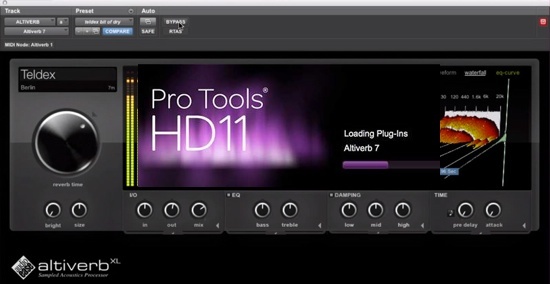 You should not upgrade to Altiverb 7.1 in case you rely on the RTAS plug-in for Pro Tools 10 or below. Altiverb 7.1 requires Pro Tools 11.0.2 or higher. Digital Performer 7 is not supported, Digital Performer 8 is. Altiverb 7.1 for Windows version has been co-developed with this Mac Altiverb 7.1 release. It is still under development but it is far progressed. We expect to have more news about it soon.